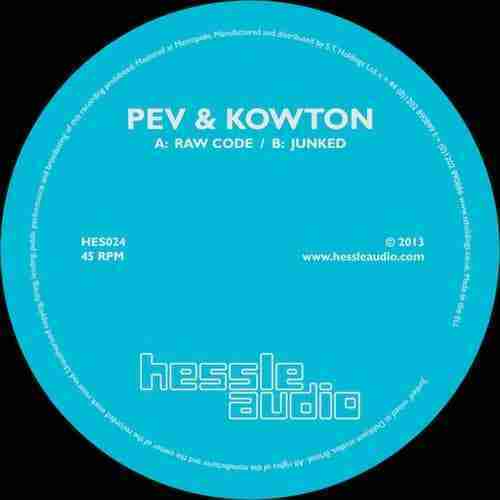 Pev & Kowton aka Peverelist and Kowton are up next on the ever compelling ‘Hessle Audio‘. The 2 track EP is due to drop February 11th and as you would expect from a Hessle signing both tracks have that ‘now’ distinct Hessle Sound, of stripped back incisive percussion meets heavy low end thump. Raw Code is the lighter of the two tracks, with a smooth airy quality interlocking with a discreetly sounding speed garage bassline, within what is otherwise a clanking techno track. Junked is a much more menacing claustrophobic affair that draws all light towards it before extinguishing it in a haunting wash of sound. Both highly recommended.